On the way to K-Joe's, we stopped to watch the Slick Skillet Serenaders busking on the street. I particularly enjoyed the guy on the left with the washboard, harmonica, kazoo, and assorted instruments. After K-Joe's, we stopped to browse in the Fleur de Paris fine hat store. 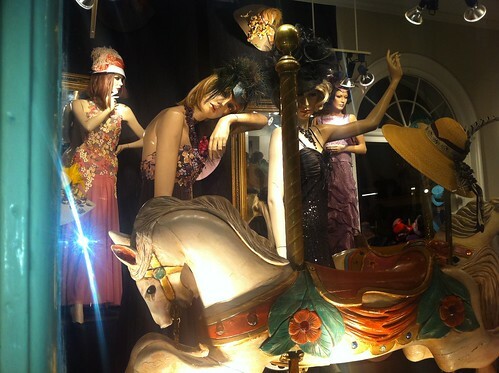 (The picture was taken of their shop window the evening before, when I hadn't yet seen the "no pictures" sign.) Fleur de Paris takes millinery to a level that I have not seen elsewhere, and to prices that I have not seen elsewhere - I saw one price tag on a hat showing $829, and I doubt that was the most expensive hat in the store. As we came into the store, there was a figure to our left with a dainty red feathered top hat, a vintage-styled dress, and elegant stockings - I was very startled when she moved, because I had thought she was a mannequin. In the afternoon, we took a walking tour produced by Friends of the Cabildo, a volunteer group supporting the Louisiana State Museum. We were deliberately looking for something very different from the ghost tour we had taken last year; last year's tour guide had definitely emphasized the gruesome, and we believed that he had gone so far as to prefer gruesome to true when a choice was necessary. In particular, according to Wikipedia, the tale of Delphine LaLaurie got exaggerated in 1946 and again in 1998 well beyond what primary materials support - and his version of the LaLaurie story definitely had all the most gruesome bits from the 1998 version. 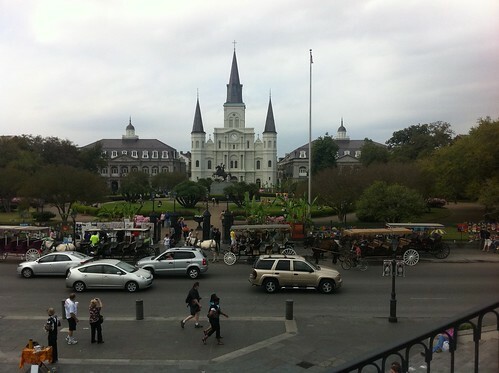 In front of the Friends of the Cabildo store, there was a woman selling copies of her book Mad Madam LaLaurie, who claimed that she was going back to the primary sources and debunking the gruesome stories. We bought a copy as a financial endorsement of truth over sensationalism. 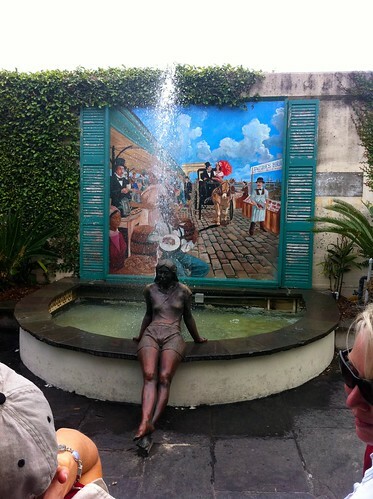 A statue and painting of the French Market, located behind the market. I recall the guide mentioning that the headscarf on the woman in the lower left of the painting meant that she was a free woman of color. 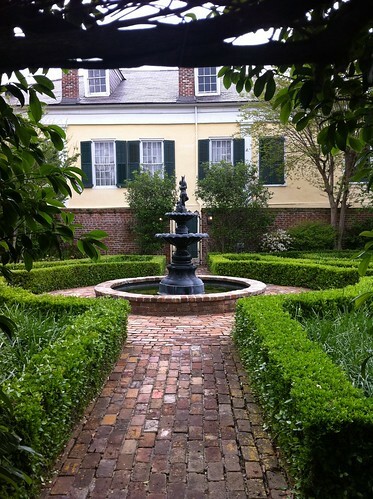 This garden was next door to the Beauregard-Keyes house. I believe that it was established by Frances Parkinson Keyes, but I'm not certain. The tour guide told us that these were called "Romeo Spikes". There was a strong double standard of sexual conduct in pre-war Louisiana, in which young men were expected to go out and sow their wild oats, but young women were supposed to remain at home and ensure that no wild oats were sown upon them. 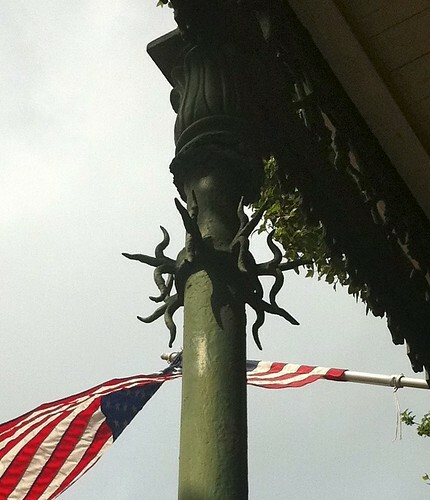 A strapping young buck might shimmy up a column to meet a miss upon a gallery - the Romeo spikes were meant to deter such rendezvous.